Anyways, I am off to work, so this has to be a super short post! love this dress! and you combined it really great with that sweater/vest! Lovin' your dress & shoes especially. CUTE. i love that detail shot of the dress -- very pretty! Gorgeous dress! I love your shoes too!! 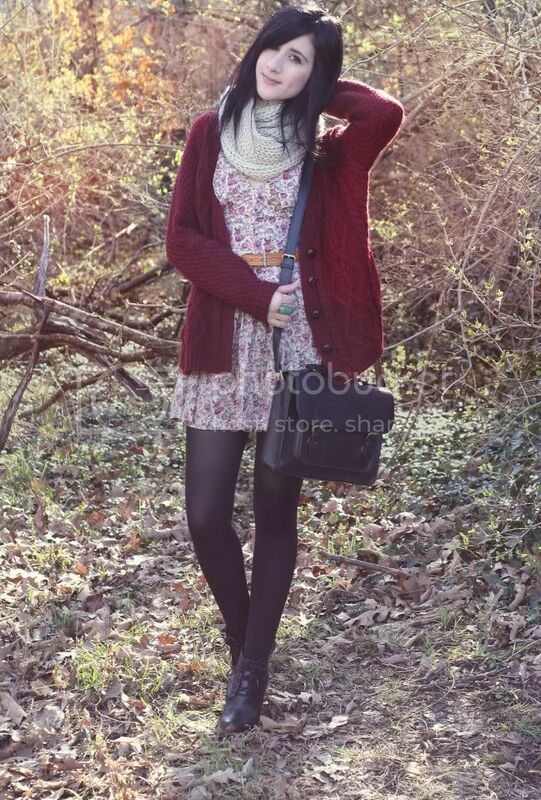 Love the dress and cardigan combination! Beautiful outfit, and those wedges are amazing. You look absolutely lovely :) I really like your satchel! I can't even imagine working around vintage clothes all day haha. I would just buy everything and not make any money. Adorable outfit. Love the colors and the wedges... and the bag because I have the same one, making me slightly as awesome as you. i absolutely love the outfit and those photos:)! you are so gorgeous! Indecisiveness at it's best! Lovely floral dress and ohlala shoes! Dang, I gotta get another job working for a vintage boutique. Sounds so fun. The floral dress is gorgerous. I love the combination of this outfit. like yout details & shoes. Oh, I love your dress and the color of your cardigan! I, too, am looking forward to this week being over! oh i love this dress so much! give me your wardrobe pleaseeee? hehe! 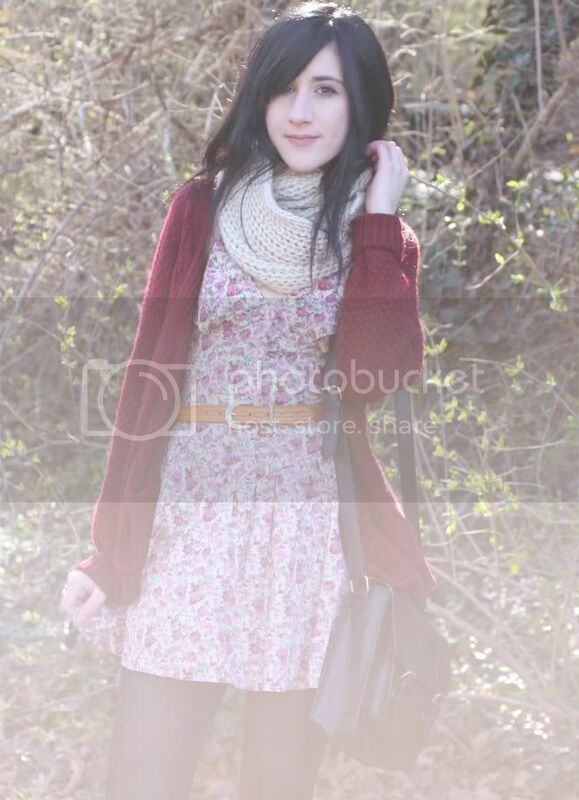 LOVE the knit scarf, and the floral dress is so adorable! perfect mixture of spring & winter! Been having a moody weather too, but it's fun to winterize spring things you did it beautifully, but cannot deny looking at that floral dress makes me wish for spring even more! the dress is awesome and so are you! LOVE 'EM!! you're a model. oh, grey dog... it's really too good. Love your dress, your shoes and your hair *_*! So beautiful. Love that cardigan! It looks so warm and cozy. such a lovely look as always! You look beautiful! I've had my eye on that cardigan for the longest time, I love it. Your shoes are amazing too! Well aren't you so cute and cozy? I love this look. I also don't really feel bad for you ... having to deal with weather that won't make up it's mind. I just want weather that decides it could be spring ... at least one day a week. That's all I ask. Bonnie I absolutely LOVE this outfit.Beautiful. nice dress with that print!! Yes it´s true, this is a lovely outfit! Hi dear!1 how are you?? i really like your hair today!it look so good! I like the colour of your cardigan. You are gorgeous, Bonnie! Sometimes I get sick of florals but every time you post looking all cute with them, it makes me want to whip my dresses out! 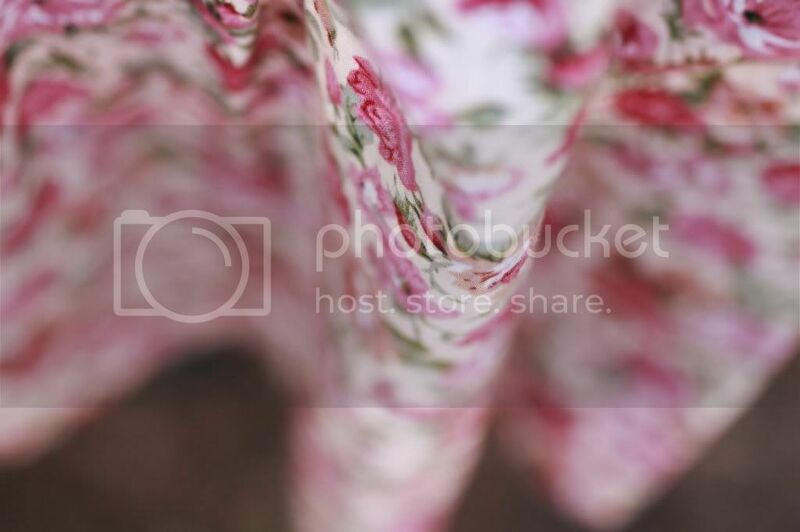 The dress is beautiful, love the closeup of the print! I am also hopeful of spring - I only wore three layers under my coat today! Yeah, the weather here is just plain demented right now. So far it's gone from snow to sunny and warm to raining to freezing raining and then tonight it's supposed to snow again. What the heck? Love the outfit as per usual! I'm sure you must always find such neat things at the vintage boutique. Have a fabulous weekend! Absolutely beautiful outfit! I love everything about it! You always look so chic & effortless! i will have to visit this amazing airstream and you one of these weekends! Nice! I love the dress! wait, is there something different with your hair? great look! i love the scarf and dress! I love the floral dress with the sweet cardi. Also, the 30th outfit for the I6L styling challenge is up. Final 30! What do you think of it so far? This is very pretty :) M.
And ths outfit is so great ! Love this, that's a beautiful color for a cardigan. I've been looking for a similar one myself but haven't found one yet (that wasn't incredibly overpriced). Where are your shoes from? They are amazing. I'm so jealous you work at a vintage shop. That is a great job. those shows are just perfect. oh and i love your hair, it looks shorter (but i think it's just an impression), maybe you shoul cut it a bit, it would suits you, imo! and love the fact thst you work in a vintage shop, how cool is that?? oh god. as if the world really wants to see another fashion blog/outfit post. do you realize that socially (in real life, you know, that place?) fashion blogs are a metaphor for a certain type of person, the type of person that basically has no intrinsic talent and can find no other "hobby", "pass time", or "inspiration" than in buying clothes and reproducing the age old stereotype that women just love to shop. your hair looks rad :) and i love the shoes! that scarf is amazing! love the cardi too! i adore floral garments. Your dress is really cute and all the knitwear totally compliments it. Ooh, I just bought that cardigan in ivory from the UO sale and I love it! I wanted to get another in green, but they sold out. I really love the red on you though. This dress is amazing, the print is gorgeous and perfect for spring! I can relate to the long and busy week. We just have to hang in there. And I love the second picture; I am a sucker for detailed pics. Such a pretty dress you´re wearing too. I love the way the dress looks with that sweater. My weather can't decide spring or winter either. Gorgeous outfit, what a lovely dress! oooooh Bonnie ! you look amazing, loooove that outfit ;) dress and vest are just perfect ! Very in love with this dress and love how you paired it with a cozy sweater and scarf! Oh, wow! You´re really beautiful! please tell me where your shoes come from! Go check out the jewellery giveaway on my Fashion Philosophy blog!